Football is the passion of men and one of the most popular sports in the world. The stadium is their main stage. But when you unload your jersey and return home, this is another stage in their lives. Let's walk into their luxury villas and see their life behind the pitch. 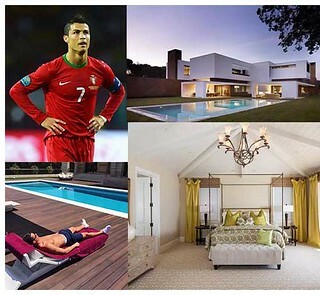 Cristiano Ronaldo’s mansion is located on a hillside in the suburbs of Madrid. It covers an area of 8,600 feet (approximately 800 square meters). It has 7 bedrooms and 8 bathrooms, a mini football field a swimming pool and hot tub. It is reported that CRonaldo's luxury home value is 4.8 million pounds, about 46 million yuan, another star Bell and Zidane are C Ronaldo's neighbor. Another luxury villa of C Ronaldo. The £4.5 million luxury home was designed by the famous architect Mora. A large number of high-tech, anti-theft systems, satellite equipment, and a full set of solar lighting are included in the mansion. In evaluating this masterpiece, Mora said: "If you use the hotel star rating, this luxury home is 7 stars." Since 2010, Messi has lived in the Bellemar district of Castelldefels, Barcelona, a quiet, upscale residential area 25 km from the centre of Barcelona. 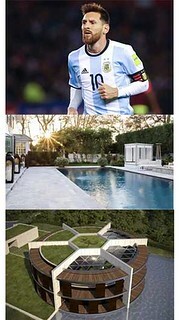 Messi’s mansion covers an area of about 10,000 square meters. In addition to the mansion, he also bought a nearby piece of land to avoid unnecessary interference. For Messi, football is the best and most accurate label, so he built a football-shaped villa. The roof of the villa is jointed by football shape piece. Some of these pieces are grass, some are solar panels. The other side of the entire pitch is a huge swimming pool. In October 2016, Neymar bought the 2.5-acre luxury home and moved in during the Christmas holiday. In addition to the helipad, dock, tennis court, sauna, massage room and spa room, the villa is equipped with a comfortable jacuzzi and even an underground wine cellar with 3,000 bottles of wine. The star Rooney put his vacation home in Barbados on the rental market for rent, with a weekly rent of £8,000. This spacious mansion has five master bedrooms, a multimedia entertainment room,one office, and a swimming pool. This house is suitable for large families and the balcony of the master bedroom offers beautiful sea views. This estate is a British National Grade II protected heritage and its history dates back to 1253 AD. There are ten bedrooms, six bathrooms and a very large football field. In addition, the manor has a room such as a restaurant and a reception room, which is 24 times larger than the average British room. And the surrounding garden around is designed by the best landscape architects in the UK. The manor values £27 million. If you want to have such beautiful swimming pool,please contact Poolking (www.poolking.co) immediately. We are swimming pool equipment suppliers. We can supply you the sand filter,pool pump,underwate light,and all pool equipment. Is this blog helpful to you? If you like it, please share it and I'll publish other related blogs for you.